Yesterday was this sort of day and I want the whole weekend to be the same way. It's raining (again) and feels like we should just snuggle in bed counting ladybugs, reading the restaurant review in The New Yorker with a sax playing dude and zebra keeping a watchful eye on our relaxation. Somebody forgot to type up the memo and pass it off to the boy, however, and he woke up early, early with a ton of energy. We have friends coming over for dinner and Zoey was found in our West Wing marathon last night (the Eagle's daughter, beginning of season 5, for all of you not in our bizarre, alternate universe of Netflix-induced entertainment). There's a bit of work to do too, but it's of the fun, sewing-related variety. Hopefully there'll be a bit of craft thrown in here next. Something to show for the rain. Let's just compile it, shall we? I absolutely love oilcloth. I was so scared when I first thought about getting some, then cutting into it was nerve-wracking and then I fell in love with the punch, punch, punch noise the machine makes as the needle pokes through and it was all over. It's so easy to work with and there are such beautiful oilcloth designs out there now. When I have a few scraps I'm going to make this lunch bag. This little tote is actually about the size for a nice, big lunch (or a good lunch with a water bottle) and I have no idea what to do with it (meaning: who's it for?!). It's lined in a fuzzy, red flannel. I do like it! This is absolute insanity. It makes me want to distance myself even more from popular culture and, well, people and that's not healthy. Who buys this stuff (if it's you, more power to you but why?)? These cardboard doll houses are cute and all, and bright too, but they're cardboard doll houses for insane amounts of money. Any child would rather make their own given the time, scraps and tools, don't you think? And I get the novelty (which I suppose is novel only if you don't have to do it, by the way) of putting your infant in a cardboard box but spend $100+ to do it? Huh? How many cute little wooden kitchens could I make for the money someone spends for one cardboard doll house? We're having a pretty great week around here, I've got to say, but there are times when I think I can't possibly take one more hour of sitting on our living room rug, spotting the boy as he climbs. I've said it before and I'll likely say it way too much in the future: this mama business is tough stuff. So it's sort-of refreshing when someone else says it too. I love this series of Smallpeople on applehead. There are sites about everything! The Mayfly noted this Street project and I note that the first street is my last name. It's fun to get a glimpse of streets all around the country. Hey, hey, I won something today (well, yesterday). Honeyflake is sending the boy and me some of her darling little gnomes. I feel so... lucky! Evidently I'm the very last person to try No Knead Bread, but I "need" to try it (oh, this is bad... I think what I really need is some more coffee to wake up a bit). It looks quite yummy. Some of this yarn is just so beautiful and it would be so neat to dye your own. I'm the slowest knitter of all time though. I want a little of this, and this and oh, no... I just went to link to my favorite and it's GONE. Gasp. Amazing fabric. My mom's on spring break (from teaching) and so yesterday the three of us (Mom, me + the boy) all headed up to the (hands down) best thrift store in the Pacific Northwest. With the boy in the back doing his melt-your-heart hand motions to Twinkle, Twinkle, Mom sitting next to me singing along with The Rainbow Connection and with a few great finds, it was just about the perfect spring break morning. T doesn't really get defined breaks so I don't either now. We get Christmas Day instead of Winter Break, and here and there we get your national holiday three day weekend. I decided yesterday that you take a spring break where you can get it and the morning was the very essence of what a break should be. Things were a bit lighter, happier and it was all just so out of our normal daily routine. Very fun. I came back with the standard daycare explosion variety plastic toys I always seem to find at this store. They're always in fantastic shape, always for about $1 and they're dirty (I've already mentioned my insanely bizarre cleaning process so I won't rehash that!). It's so handy to have some variety around here in the toy department (ha!-- That's what it'll really look like soon if I don't purge a bit: an actual toy department). In my experience kids the boy's age seem to love playing with things like empty boxes, Tupperware and they love to do things like empty an entire drawer of clothing or cupboard of pots and pans. This is fun, important work. Pushing buttons on a crazy/loud hunk of plastic isn't the same as nesting all of the mixing bowls back together. However, the right mix of extras really breaks up what can be a lot of time here in our 700-800 square foot abode and yesterday I found things like the most darling little play house for the boy's Little People and a little barn (we're going to have to find some farm animals!). I think really, in the back of my mind, there's a small idea of wanting to provide everything to the boy on a very limited income and feeling like I want the boy to have the variety and fun of my childhood (though my mom and dad provided all of that variety and fun with a limited income too, and it was a wonderful and enriched childhood). Anyhow, I know daycare variety explosion toys aren't necessary but a few are fun. There's a dress that's been hanging right out in the open for $4 for months at this store. I always stop and eye it and want it, though I have no earthly idea where I'd wear it (we don't do nice, semi-fancy white dress-type events around here). It was there again, and I decided I had to just get it. With the boy's waning patience I didn't have it in me to try it on but it looked big. It is big for me on top, and it's too snug around my, er, big bottom. This is not the best combo (too big on top, too snug on bottom) for my self-image. It may have to go to my (tall, skinny, beautiful) sister. It's handmade and really gorgeous in person with the most amazing fabric. So this all brings me to what I've put off for months (and months). Our jogging stroller, which hurt me to buy in the first place (I hate spending loads of money, you know), was left under a very covered front porch-type area for a few days in the rainy fall. It was completely covered, mind you, but it grew a nasty black mold on the straps and a bit on the seat too. I googled solutions and all of these people were saying you had to throw it away. My friend said I should just wash it with bleach water and call it good. So here's the question: If I wash and scrub and just use it am I a bad mother, putting her child at risk for a nasty something or other? Do I buy a new one (I've been scanning Craigslist for months to no avail)? Would you replace the straps (that's the part I worry about-- what if he put them in his mouth?) somehow? How would I go about doing that? So that's the current excuse for why my bottom is too big. Convenient that I've done nothing about the stroller for months and months so, oops!, I can't run. Mom figured I should take some different pictures of Henry + Olivia to show how big they really are. I like the two of them sitting on the little chair together! I tried to find more vintage angora and lamb's wool fabric at the thrift store again but there wasn't any. Go figure. The rain cleared for a beautifully sunny day yesterday. We headed off to the beach and for the first time the boy was able to just run around on his own, finding clams and always heading for the water through the muck. I kept trying to hold his hand because it was so slippery and I could just see the potential wipe-outs and subsequent muddings of the face and clothes. The boy was happy, happy until I'd try to grab his hand; he wanted to explore and run on his own! I was so nervous about T and the boy heading out on Saturday. They were going fairly far, and the roads were just a mess with the downpours (urban flooding, you know). I'm never very far away from the boy and I was so tense about it all. I kept telling T things he knows, and it should be said that he's an amazing father who always knows what to do for the boy (he doesn't need me to tell him anything). Anyhow, they had a grand time together and came home safe and sound. Then last night while I was cooking dinner and T was about six inches away from the boy, spotting him as descended the Morris chair (the boy's all-time favorite activity now: climbing), the boy took a face plant dive onto the floor. I'm not used to the terror of all of that blood and of not knowing for ten minutes if your child is actually OK or not. I suppose you might never get used to the terror of that feeling, and the helplessness when your baby is hurting and there really isn't anything you can do about it. All weekend I'd been nervous about him venturing out and I tried far too much to keep him from falling at the beach, and then when we were home and he had T right next to him he fell so hard. His mouth is all so cut-up and the poor boy was exhausted and so hungry; after an hour or so of crying, and after frozen peas and yo-yo (yogurt-- his idea) we just got ready for bed and he fell right asleep. Anyhow, things like this will happen with a climbing little boy and I can't always control his world and I can't always worry away the troubles. Today I'm going to give him more Tylenol and lots of love though and I suppose he'll be right back at it with the Morris chair. He climbs up, turns around, sits down and clasps his hands together with the most proud and happy look on his face. Right above him, to the left on the mantle when he sits in the Morris chair, are Henry and Olivia. Henry and Olivia are Rose's siblings made of vintage angora and lamb's wool. Olivia's button eyes are from my Great Grandpa's military long underwear (shhh... perhaps we shouldn't mention this to her). Henry's a good listener and great company, and Olivia can be a bit of a pill (but she's a nice little bird, don't get me wrong). Henry's in the little shop right now. I love these birds. Alright. I'm finishing a tutorial for turning a Martha Stewart dish towel into a nice little bag with interfacing and a lining... Tomorrow? I love these bags. Aaahh, there's the boy stirring so early in the morning. I suppose that mouth is really going to hurt when he wakes. I love that boy. The rain is amazing. In the Pacific Northwest lots of people tend to dismiss things like umbrellas and raincoats; you'd just be lugging them around far too much! Today on an errand across town, however, I saw a handful of people at various points along the route in full rain gear. With a fishing pole in hand they would have looked at home in the middle of a river. Spring, PNW-style, is here. Not far from our home though we did also see a young girl with a lemonade stand. I still can't decide if was gutsy, a little "off" or just all a sign of spring where we live. My guys took off for the afternoon and early evening, leaving me a chance to get a little done. I listened to This American Life (you can, by the way, watch their new TV show online), baked (eating far too much cookie dough) and created a bit. I'll share some more about that tomorrow! For now you should definitely look at the incredible photography at Bits and Pieces of a Happy Life. She sews amazing things, has four children and takes those gorgeous photos. I feel like eating more cookie dough. Barbara Brandeburg's quilting is equally amazing. I really enjoy this site too... She's making the banners I've been working on! They're everywhere! While T and the boy were off I spent some quiet time in the yard (in the rain, of course). The photos are from this afternoon. I looked forward to time by myself all week, and then I practically knocked the chair over in excitement when I looked up from the sewing machine and saw my guys at the front door. Time to join their slumber. We did a little of this yesterday, and the peanut butter balls (with substitutions... it seems you can really mix these up!) are almost gone. We did a lot of this yesterday too. Tomorrow I'm going to work on birds, mats and those poor doll quilts. They were started before the craze, and now would you just look?! Thanks, everyone, for all of the fantastic food advice. I went crazy and bought the olive oil I'd been holding out on for six months (too expensive for the current budget, I thought) and a bit o' prosciutto to boot. Forgive the busy look of the site but it is a really good resource and the No-Bake Granola Bars are a family favorite here. I thought I should share right back! When I first started writing here with two posts last November it was a bit about dinners too, but a lot about wishing I was more connected. This morning, when I checked the comments, I found all sorts of wonderful suggestions about one of the things that's really been bugging me. Then I quickly found all of the beautiful doll quilts I mentioned (how inspiring) and checked in with Kristin's Free Friday and read a little about her philosophy of raising her daughter and was inspired once again. On my first cup of coffee in my bathrobe I already felt connected to other mamas who work to create what I'm working to create each day. Somehow what I wanted so deeply last November is already there, bit by bit, here. I'm so thankful. Oh, and I'm going to buy that book. Happy Friday. I wish you a wonderful weekend. I had a dream (don't you just love it when people tell you all about your dreams?-- I know, it'll be short + painless, I promise) where something was happening that I should have been worrying about. In the dream I was worrying about why I wasn't worrying, and then when I first woke up I was worrying about having a dream about worrying about not worrying. Crazy. Anyhow, I've been worrying about too much and I've been too hard on myself. This Mama/being at home with the babe stuff is tough stuff sometimes. I love it, even the more difficult moments, but there aren't any sort of standardized units of measurement for success. The boy is happy and healthy and brilliant (!) so that is the big success. The little things, at times, seem a bit out of control though and at the moment there are a lot of little things. So, one thing that's been bugging me is our food situation. One of the boys around here can't have any dairy at all in anything, and the other (bigger) guy has had to try a wheat-, gluten- and dairy-free diet lately. It feels like we cycle through the same ten or so meals all the time, and though I'm in love with the new kitchen I think I hate to cook lately (and you can't, um, actually cook on the boy's cute stove). It's hard to find combos that will suit everyone's dietary needs and I always feel like I need to cut corners at the grocery store to save a little money. "Did you eat some breakfast?" "Ummm... I had a little applesauce." "Aah, no... There isn't actually any cereal left." "Sorry for the pathetic lunch. I guess I could have made these into peanut butter and jelly tortilla wraps?" "Um, no. They'd be peanut butter and jelly wraps without the jelly." Anyhow, time for an intervention. I found lots of cookbooks for inspiration at the library (Book Babies yesterday, of course, and can I just add in how adorable the boy is when he does the handsigns for "Twinkle, Twinkle?"). And because we can't just go healthy all the time I even got this book on pies too. I've written down the ingredients list for this granola, these spring rolls (it's spring! ), these peanut butter balls (let's help out those lunches a bit, eh?) and some of this crostini. I suppose I'll just adapt as I go so everyone can eat everything... Other suggestions? Like I said, it's bad around here. Today's big goal is a super-duper grocery shopping bonanza (sometimes I say stuff like that to make it sound like what it's most definitely not: exciting + fun!). I have help with my ongoing craft tidy, which can be hilarious fun. I really do love that point of total disaster as you're redoing things, one step before the panic and two steps before it's all so much better. With the boy's hands in everything we hit the disaster point a bit earlier. He's so good now about taking things places. He'll bring all of the ribbons to the front door, for example, ribbon by ribbon. This is serious business. ...birds sing, and flowers grow. Elizabeth Mitchell's beautiful song sings through my head countless times a day lately. Each time I look at the boy I can feel my love growing, just as she sings. Last night he was playing with T and he dumped all of the little blocks out of the box. The boy went over to the big stool, put the box upside down to give him a higher base and then started stacking from there. Then he ran to tell me all about it and dragged me over to look. Somehow it was all so simple and brilliant; if the goal is to make your stack tall, why not start a little higher? He helps me look at everything in a new way. We celebrated the official start of spring (no snow but biting cold) with a blustery walk with my sister to coffee and rice cakes. Happy, happy spring. I seem to need it more this year than ever before, but maybe it's always that way and I just forget. Bring on the buds, sun, short-sleeves, blue sky... even the growing grass! The first half of the tutorial compilation is up and I think it looks pretty good! The first Flickr feature is up too and I'm itching to make one of those bags myself. I saw this link to an incredible online store with vintage everything for sewing over at Vasilisa the Fair. Check out all of the buttons! Just look at all of these softies. I think even if I was at my most crabby I would still smile to see these, and in it I found that tea cozy I "lost" a long time ago. I thought it looked like something perfect for my sister and her boyfriend, and then I lost the link. Ta da! Isn't it great? I first saw it here, then I dreamed about it and wrote about it here and got a little faucet advice here. It took some time to finish this little kitchen! The sink is a thrifted bowl, the faucet is courtesy of a $10 gift card to Home Depot and though we spent more for the "good stuff" the wood wasn't really all that much. The curtain's from fabric I had on hand (we've got a little gingham theme going with the boy's apron). A little paint from our collection and we were off and cooking! I'm indebted to Sam's grandpa over at All Buttoned Up for the inspiration and design, and to the boy's Boppa (a.k.a. my dad) for lending a ton of time, effort, tools and knowledge to the kitchen. Without my dad there wouldn't be a little kitchen! We tried to channel Norm in our efforts, and I tried to explain to my dad how woodworking is so much like sewing. It really is! Anyhow, Norm would be proud and I'm proud too. I designed the dimensions (on a little piece of scrap paper) around these baskets. Storage, sweet, hidden storage! When I was little my sister and I would spend weeks in the summer at my grandparents' farm. They had cows, land, and I had the wonderful freedom to roam and to do things like play in the hay loft that I wish for every child. It's my favorite place in the whole world. One summer I distinctly remember finding a plan for a child's cabin in one of my grandma's older books. I was super-excited and ready to build, and Grandma said I had to ask Grandpa. Grandpa very kindly persuaded me that it was a bit too much of a project for me to finish in the time I had to visit. In some way I feel like I finally finished a part of my little cabin yesterday. I have a tendency to excitedly try to bite off more than I can chew; I'm so thankful to have people in my life who persuade me gently to wait (20 or so years) and people who help me build (my Dad always helps me create whatever I need: warm fires in winter, wholesome meals for the boy with goods from his incredible garden, a little kitchen, a happy life...). We're making things like strawberry and pear soup. T + I decided that would be a great name for a blog, if it isn't already taken (take it if it isn't!). Anyhow, yesterday was full of mama drama and I'm not very proud of it. First off I'm thrilled beyond belief that my intro and pattern reviews are posted on the Sew, Mama, Sew blog. I'm so excited to be working with Kristin, interviewing other crafty mamas and doing just a tad more writing. It's the most wonderful opportunity and I can't believe that it's an opportunity out there for me. Amazing. So, go buy a little fabric... (come back though). We tidied like crazy this weekend and have clean cars to prove it. The boy has a brand-new, cozy + gigantic rug in his room and he can build towers with the big blocks and abandon now (without me cringing and saying weakly-- "The floor... Oh, dear..."). I accomplished a massive Craft Tidy. I'm learning how to hide a crafty mama's junk in a 700-800 square foot house. Packaging items for the little shop are in the tall basket in the top photo (in the living room). Fabric paint, sewing machine accouterments, snaps, pins and other assorted items are in a big basket in the bedroom. Big fabric scraps are in this huge basket which normally sits right near our bed, between the bookshelf and the dresser. Are you sensing a theme? Baskets. Yep, baskets. There's another gigantic basket on the dryer housing finished projects for the shop and for friends + family, and a basket on my dresser with thread + ribbons. We sort-of stood there stunned for a few seconds. It was gorgeous. If you squint your eyes just a little can you still imagine how pretty it all was? Okay. Let's move on from that whole disaster. The entire day felt pretty much like that. I had the best of intentions and they all just fell apart at the last moment. The drama wasn't about the fabric, it was more about needing a break (I think). Oh, the boy's climbing now. Things get quiet and I get this feeling and I run over to where he is and he's about two feet higher than he should be. Phew. Onto calmer, craftier things tomorrow. Seattle had the same amount of traffic we remembered (it's only been a few months since my last visit, after all), but the Eastside had more cranes. The arboretum was as beautiful as ever and it was fun to be there with the boy thinking about all of the walks and talks T + I had, dreaming of him. In another week the blossoms will be at their peak but they were quite pretty yesterday. I remember how quiet the boy was last year when we took the same trip. This year he was asking about everything and running around in the mud on his own. The boy was fascinated with the benches, I was fascinated with documenting it all and poor T had to direct us all through the trees. We didn't find socks or shoes for T or a big rug for the boy. 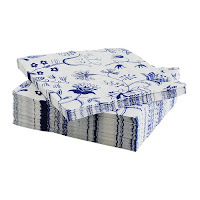 I did stock up on these napkins, of course, and a few of these rugs (below) which are so beautiful in person (not so much in the pic). When we arrived at Ikea in the late afternoon we thought it was closed. There were a handful of cars and things looked dark and empty. Ta da! I'll let you in on the Ikea shopping secret: You evidently just go around dinner time and everybody and everything is much, much happier. We bought a cute little pup tent for a song to create play space in our play space here at home. 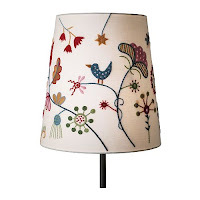 I so wanted this lampshade, but have no where to put it and couldn't justify it. Sigh. It's beautiful. Speaking of "for a song" I've been thinking a lot about what people charge for what they create and here's what I think: Everybody needs to collectively ask for more money for these gorgeous things they lovingly handcraft. Over at Etsy it's just too depressing lately to look at what people are charging for things that must take hours and hours of effort. When they charge so little it devalues every one's creations. Now, I know you charge what you think is best and some people live off what they make this way, and it's none of my business and... I'm just sad to go to the store and see a 'Doohicky' (or whatnot) without soul, made by a machine in some obscure corner of the world, sold for so very little because everyone seems conditioned to think this is what a "'Doohicky' like this" is worth to them. Then the people who are handcrafting beautiful doohickies on their own feel like others will only pay what they pay in stores. The store doohickies are perfect in that they have no mistakes, no funny stitches and no history. The yarn wasn't carried around town and knit in carpool lines. The fabric wasn't carried around a house by a two year old. There's no thought behind the item... no soul. 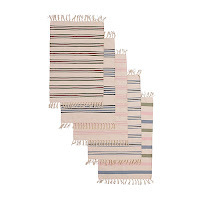 Now I just bought some rugs without soul just last night because they were super-cheap, and we can't afford to buy all of our food at the coop and the farmer's market. I know we're not going to all run out and decide together that we need to charge more (and spend more), but I'm just saying the doohickies are worth more. Period. Yesterday we dropped off my letter of resignation. I haven't taught for a year and a half now, and we wanted to make this work and it is working. The security of having the position in my back pocket is gone, and it wasn't as hard to let go as I thought it might be. I saw this young girl (early 20's) in the Ikea kids' section who ran over to the 99 cent blue tubs and yelled, "Yes! YES, yes, yes!!" and I knew instantly that she was a new teacher. I have about 50 of those tubs stored away (they're perfect for organizing books in an elementary classroom library), and I wasn't envious about the classroom she was taking those tubs to; I was just looking around for my boy. They're everywhere, and now they're in the little shop too. My mom saved the day with a little hand-stitching (after my tormented efforts with the blue). They are so grabby + tossable. Yep. Very grabby + tossable. Today's about lists, taxes, Book Babies at the library and it's always, always about the boy. I love this crazy little boy. By the by, I'd like to actually complete some of the things on the aforementioned lists. The "uh-oh" [dis]organization effort is at the chaos stage so, of course, I'm sitting here doing some extreme avoidance. It's enough to make you want to hide your head in a pot. Happy Zombie inspired me to go check on China and it looks like I'm still tame enough to break on through the firewall. I'll have to work on that. I'm having fun exploring Flickr and so here's my new little page... I do think it's just a touch bit creepy how much you can discover by what people upload there. I'll stick to crafty pictures, thank you very much. I think these look extremely yummy (and easy-- easy is good). I keep thinking about the ripple blanket over at Posie which worries me. I know myself well enough to understand that there's absolutely no way I could complete something like that at this point in my patience growth curve, and I don't have $4000 to spare (yep-- $4000). I know it's old news and it's taken the crafty blog world by storm but have you checked in with these people? My concern is that I feel extra-sad now for all of the crocheted blankets at thrift stores, sort-of a sad-kitten-at-the-pound feeling like I should bring them all home with me for a good life. It could be a problem. Speaking of buying, we're going to IKEA tomorrow and I'm bracing myself against wanting all sorts of things. We're stopping there for a rug for the boy's room on our way up to Seattle. This is our big birthday "bash" for T (it's been put off several times) so we need to go to some favorite stores and buy birthday socks (those are just socks that you buy for your birthday because you need them desperately and you can justify the purchase as a "present" to yourself-- sad... They don't have little balloons all over them or anything), shoes, pants, and maybe a book or two at our favorite Seattle bookstore. I loved the recent episode Kid Logic from This American Life. Birds are singing, sun is shining... joy radiates. I have no idea what the weather's like outside right now but inside things are looking good. Just look at what my mother-in-law gave me when the boy and I stopped by for a visit yesterday. Wait. Did you see it all? Look! There's a whole stack of vintage fabric she and my father-in-law found in Portland last weekend, and then there's a gigantic stack of fabric cut out to make yo-yos. Imagine the possibilities! Needless to say I have a wonderful mother-in-law. And father-in-law. My brother- and sister-in-law aren't too shabby either. I bruised my right hip from all of the dancing the boy and I have done through his illness. He insists on turning on jazz and dancing on the rug. He'll be sad about something and he runs over to the rug in the middle of the living room; he stamps his feet and points urgently at the ground while shaking his head like Ray saying, "Na na na na!" (his favorite nighttime music has a "na na" song where all of the "words" are "na na"). This isn't dancing. It means, "Mama! Pick me up and you dance." We're slowly venturing out though he's getting tired quickly and has a short fuse (note the "outrage" discussion in my last post). I'm a bit exhausted, but I'm still smiling. Hmmm... That's not right. I'm truly exhausted, but I'm still smiling. Yep. That's it. Is it strange to be obsessively dreaming about vacations? We never go on "holiday" and it's never much of an issue but I'm dreaming constantly of heading to the beach. I'm also daydreaming about spending time with my guy (the older one). We've been so busy lately and get caught up in the "Did you do the...? Should we pay the...? Could you...? The boy needs..." and I miss looking up from my coffee and The New Yorker in a cafe on a weekend morning, smiling at T across the table. I can look over at him on his laptop over there from my laptop here, but there's laundry blocking the view, there are dishes piled in the sink, the ironing board is to my right, bills are stacked behind the computer screen and I have a white face mask on. It's not the same. Evidently the Pineapple Express has moved into the Pacific Northwest, and we're getting rain in a big way. It's also very warm around here. We're (I'm) desperate for non-shopping opportunitie s to get out of the house, but the boy is still under the weather. The basement is almost done after a good day's work on Saturday, and today we finally found the perfect little faucet for the boy's kitchen (I think I have trouble actually completing projects but he's been playing away with it "as is" so it moved to the back burner, so to speak). Painting ceilings and making new splat mats for the little shop aren't the most creative, exciting ways to spend my time but it is important and I can think of worse things! I absolutely love the black flourish pattern with the red trim. Aaahh, to be making beautiful quilts... Look at this crazy nine patch and this amazing blockswap charity quilt. Oh, and this sweet little thing (under "Thank you, Josie"). Just look at those baby gifts, would you? !-- It certainly puts the ones I'm currently working on to shame. I'm full of ideas; the creativity is out of control. There's no time to do any of it, however, so it's all just stuck inside for the moment. The boy is letting something new out, however. As T says, the boy has discovered outrage. When something didn't go his way befo re and he really didn't like it, the boy would cry and get upset. Lately he doesn't just think it's sad, he thinks it's wrong. It's injustice. It's Mama's fault! Oh, and though sadly it's not Saturday or Sunday any longer, it might be some day as you're reading this. Go to KPLU and groove to some blues in the evening. You can get a super-lot done or it might put you in a really good mood. I just wish they still had their blues show on Friday nights so I could get a little done then rather than on Sunday nights when I should be snoozing! I think the boy must be getting some more molars in addition to this rotten cold he's had for a week. I know I'm still relatively new to the mama game and I know I'm over-cautious and a worrywart, but the boy is just miserable. He won't sleep much in the day with this thing, but continues to sleep really well at night (thank goodness) and he isn't pulling at his ears so I don't think it's an ear thing. He's just not acting like my boy. I've been holding off on taking him in to the doctor's because there's nothing really tangible other than bad cold symptoms and I know they'll just send us home to wait it out. I'm worried, tired and sad for my poor boy. I was creeping around while he napped and it's been so dark here the last few days. I realized I was doing everything without any lights on, like he would sense me if there was light in the house and wake up and sob. Being quiet is one thing but feeling almost-invisible because you don't have a desk lamp on?-- That's weird. That's when you know a sick week stuck inside is getting to you. I kind-of want to keep this, but I bought the fabric with the express understanding (between me, myself + I) that it would be a gift. For someone else. Sigh. Here's the pink purse. I'm pretty sure owner will love it, but she's not getting it for awhile! T + I have this crazy plan for a "Homemade Christmas," but it means I have to work now for a little December joy. The pattern review for this and the other (more sophisticated + tricky) purse will be up soon over at SewMamaSew, which gives me a little thrill. I did the button holes wrong, but I did actually make button holes. I always thought this was the sign of a real seamstress. If you can make button holes you must really be able to sew! Evidently you only have to have the right machine, though, so it might not be the pinnacle of craftiness I once thought it was. I used Amy Butler's In Town Bag Pattern and I really loved it. I think I'm a lousy cook because I don't have enough experience to cook the way I do (a pinch of that... We don't have any of this?-- let's throw some of this in) and I think it's the same way with my sewing. Patterns really help you look good if you actually follow the directions. You get edible cookies and cute, little purses. Rose (remember Rose?) flew the coop this week so Henry is on his way to our little corner of the world. Doll quilts and oilcloth are draped around the livingroom, and my campaign for reorganization is, as the boy would say, at the "Uh Oh"-stage. T really is a patient man. This purse sort-of reminded me of the ones over at Posie Gets Cozy. It would be fun to make more with a variety of fabrics. This one has vintage bias tape instead of ribbons on the seams, courtesy of Mom's stash... Happy Friday.